“Never tell me the odds!” growled space pilot Han Solo to the taller of the two robots, the yellow one with the British accent. 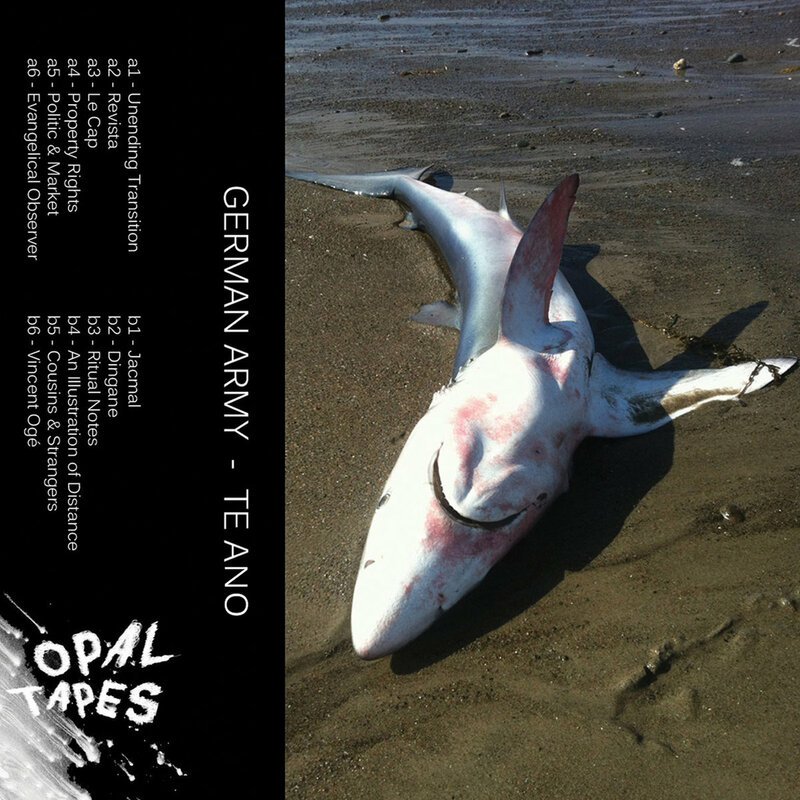 The odds are always stacked against you, I’m here to reiterate and confirm, and the odds of me catching up to German Army via Cassette Gods review submissions is approximately 41 to 1, or something like that. Because I was never good at math, I’ll round that up to “long shot” and just enjoy my time with the GeAr tapes that do end up in my pile. I think there are 41 GeAr releases overall too, which is where I get that number from. I’m probably off by fifty or so, though. They’re all good too. This one’s good. In Tape 36 (or whatever), GeAr-heads and the general public alike will find lots to enjoy, mainly because those who turn on the Discovery Channel, or whichever one it is, during “Shark Week” will like the cover. Te Ano, translating to “the ano” when wrung through the old Spanish-ometer (just kidding, it means “I love you”), glistens in the rain and blisters upon contact, its white-hot molten tribal industrialisms a lurking school of megalodon in the midnight sea, and you oh listener of music, are shipwrecked and adrift, awaiting the rescue that will never come. The ear becomes attuned to the GeAr, the monsters become attuned to the light, and we all fight through the chum for the best hunks. We have become the monsters, the famished sharks always eating, constantly swimming, the sun and the beach and the air our only enemies. We are master hunters, and we deserve music to hunt to. What are your chances, alone, in the water, do you think? I’m pretty sure they’re 41 to 1. Have you delved into the vast German Army catalog yet? Child, you should get started, you have much to hear, and much to accomplish.